I thought that today’s parent’s tossed their children a Nintendo, Xbox, PlayStation or other such electronic gaming device and told them to shut-up. Apparently that is not the case. I was somewhat amazed this summer by how many of the children who came over for playdates with my children knew how to play card games. And they genuinely seemed to enjoy playing them! So it seems that many parents are still teaching their children how to play cards. I guess spending some quality time with parents and family is something that children need. Card games provide an opportunity for parents to actively engage their children in an activity that can be fun for both children and adults. Card games also help develop children’s memory, logic and strategic thinking as they try to outwit each other and win the game! Card games are great for camping trips and family holidays. Children can enjoy them, and a deck of cards takes up next to no room in the luggage. My children first started playing cards on a recent family holiday. Following are rules for two simple children’s card games. A quick Google search will reveal endless variations to these popular games. My house rules are stripped back to just the basics so that children just starting to play card games can enjoy them … and actively compete with adults! My two children are eight and four-and-a-half years old. The eight year old has easily mastered these games. The four-and-a-half year old understands the playing concepts, but struggles with quickly recognising some of the higher numbers and face cards. Normal 52-card pack (no jokers). 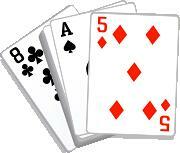 Get rid of the cards in your hand onto a discard pile by matching the number or suit of the previous discard. The dealer deals 5 cards to each player (7 each if there are only 2 players). The remaining cards are placed face down on the table to form a stock, and the top card is turned face up and placed beside the stock to start the discard pile. Starting with the player to dealer’s left, and continuing clockwise, each player in turn must either play a legal card face up on top of the discard pile, or draw a card from the undealt stock. The following plays are legal. If the top card of the discard pile is not an eight, you may play any card which matches the rank or suit of the previous card (for example if the top card was the king of hearts you could play any king or any heart). An eight may be played on any card, and the player of the eight must nominate a suit. If an eight is on top of the pile, you must play either another eight or any card of the suit nominated by the person who played the eight. If the stock pile is used up, the cards are shuffled and turned over to begin a new stock. The first player who gets rid of all their cards wins. Best for 3 to 6 players, but 2 can play. The object is to collect pairs (two cards of the same rank) by asking other players for cards you think they may have. Whoever collects the most pairs wins. The dealer deals 5 cards to each player (7 each for 2 players). The remaining cards are placed face down on the table to form a stock. Play starts with the person to the dealer’s left and continues clockwise. The player whose turn it is asks another player for his or her cards of a particular rank. For example, “Steve, do you have any threes?” The player who is asking must have at least one card of the rank they asked for in their hand. The recipient of the request must then hand over a card of that rank, if they have one. The player places the pair on the table and play moves to the next person. If the recipient of the request has no card of the requested rank, he or she tells the player to “go fish,” and the player draws a card from the stock. If the player receives the card he or she wanted from the stock, they place the pair in front of them and draws another card from the stock. Play then moves to the next person. If a player runs out of cards, they draw two cards from the stock and continue to play. Play continues until the stock runs out and all pairs have been found. The player who collects the most pairs wins. This entry was posted in Children and tagged Card Games, Children on 25 January 2012 by Rex.